​Your cupcakes made my daughter’s 6th birthday party so perfect. We cannot thank you enough. We were delighted by the end-to- end experience of ordering and, of course, eating your wonderful work. We’ll definitely call you for all of our future cake needs! I wanted to let you know how much we all enjoyed the cake you created for my book launch. It looked amazing! And I also really appreciated the extra cupcakes which were, quite honestly, adorable and very tasty. Thanks again for making a special day even more so. Thank you so much for the cake! It was the highlight of the night - Quinn was in shock! I appreciate the work and detail you did to make this cake amazing. It also tasted amazing! I'm incredibly happy! Thank you x3!! Just got a call from my wife and she said the cake is insane! She absolutely loved it. Thanks so much. Have an awesome weekend and thank you again! The pancake cake was a HUGE hit! It made the party and everyone is still talking about how gorgeous, innovative and delicious it was! A few pics for you. I can’t wait to see what we come up with for #4! Thanks again! We have used "CbCF" for a number of special family events at our home in DC. Chris has accommodated each one of our needs from cookies to mini cupcakes to full size cupcakes to formal cakes. The are always a show stopper both by look and taste. So much care is put into each cake and everyone we have hosted has had nothing but praise. We look forward to using Chris again. The cake was amazing and very well received. The face of the cake looked great and the crowd loved it. You really did a terrific job. And, quite frankly, it was the best birthday cake I think I have ever tasted. The inside was good and light, so I was able to devour about 4 pieces. You received a lot compliments and marketing at the party. You are amazingly talented!! Thanks so much for bringing my idea to life! She absolutely loved the cake and cookies. Actually, everyone did!!! AND lemon happened to be her favorite cake flavor so I was winning all around! Everyone was so complimentary on the design and flavor. You truly know what you're doing! Thank you again and I look forward to being able to work with you again!!! Oh my gosh I don't know where to start. The cake you made for me this past Saturday - HEAVENLY. It was absolutely GORGEOUS - way above my expectations that were already high!!!!!!! And my goodness it tasted AMAZING, it was out of this world!!!! Soooo smooth and delicious!!!!! All the guests were loving it so much and asking where I got such a great cake. Told them about you and how you drove it here all the way from Maryland!!!!!! Nobody could have done a more perfect cake for my wedding, and I am sooo thankful to you!!!! You really are the best!! I will recommend you to everyone and write some amazing reviews about you. Thank you so much Chris! I just wanted to say what an impressive design and awesome tasting cake you made for Lorenzo's promotion to Captain in the US Navy! The presentation was a success and everyone wanted to know who made the cake. Not only was the cake decorated and artfully creative, the cake itself was very moist and delicious. I also just wanted to say how impressed I was with the customer service. From the time I ordered the cake until it was hand delivered, I had all the confidence in the world that the final product was going to be professional. Chris your attitude and your personalized service made me feel like I was your first customer!! That said a lot about your work ethics. "Bravo Zulu" is a Navy praise for a job well done, I would like to say to you Chris BRAVO ZULU. It goes without saying that I will be back again! OMG! The cake was AMAZING!!! It was a total show-stopper and taste delicious. The cake was a huge hit at my baby shower yesterday, and friends and family are still raving about it. Thank you for making such an incredible masterpiece to enjoy on our special day. Baby Luke will definitely be thrilled with his future Cakes by Chris Furin birthday cakes! I just wanted to tell you that the cake and cupcakes were spectacular and EVERYONE loved them. You are AMAZING!!! I want to thank you so much your wonderful cake. It was a hit! Not only was it fabulous and a feast to the eyes, but it was delicious as well. The cupcakes were fantastic, people were grabbing them like there was no tomorrow. Thank you again for everything. BTW, one lady was sooo impress by your cake that she asked me for your information. We will definitely do business again in the future. Thank you so much for the absolutely stunning cake. It truly went above and beyond my expectations. Not only was it beautiful but it tasted amazing. It stole the show and helped get that "YES!". Quick thank you for the fantastic cake you made for Tony's retirement from the Army! As best described, one of my guests who went gluten free for health reasons a year ago ate 3 pieces of the cake because the cake was so beautiful and then it was the best cake she had ever eaten! The cake was just perfect and it was amazing to eat as well. Thank you so much for all you did to help us celebrate the life of Stella. Fudge between the layers - to die for!!! I just wanted to thank you again for the amazing, amazing Death Star cake you made for Hunter's birthday. Everyone at the party was blow away by it. I so appreciated the care you took with transporting it and making sure you were right on time for delivery. It was a HUGE, HUGE hit. And you were so easy to work with and talk to, too... definitely assuaged any worry (and there was a lot) about how this cake would turn out. I hope you got some good shots of it for your portfolio! THANK YOU AGAIN and can't wait to use you next year. Another HUGE hit! Not surprising - you're the BEST!!! Love love love the cake (ate waaaay too much of it than I will admit. The chocolate was my favorite). Thanks for making our special birthdays so magical. We will be in touch for more:). You are a true artist in all respects. THANK YOU!!! Best. Cakes. Ever. (Seriously, we had another birthday party on Sunday, and yours put that cake to shame.) Oh my goodness was that cake a hit and delicious to boot! I can't even tell you the number of compliments we received (and happy green faces running around). Thank you, thank you, THANK YOU! We were thrilled with everything, from the taste to your amazing artistry to your impeccable service. I have already passed out your info to a number of our guests. We will absolutely be repeat customers! It was a special night and we were delighted with this wonderful cake. Thanks for everything. It was a pleasure and we will be ordering another tasty cake very soon! AMAZING!!! Simply amazing... You outdid yourself for Lindsay's baby shower cake. Everyone was ooohing and aaaahing over it and, of course, asking who made the cake. Wish you had left more business cards than you did, because folks were asking for them. I think you will be getting quite a bit of business from this one event! ​Oh my God! The cake was fantastic and Gary absolutely loved it! It was beautiful and we loved the 3-D representations and how things were located in lots of places. He was particularly blown away by the bottle of MacCallan 12 - his go-to single malt bottle. Everyone oohed and awed when they saw the cake and then again when they ate it! Thanks for everything and we’ll talk again when we celebrate our next occasion. And thank you for the amazing cakes. I heard back from both clients that the cake not only looked amazing, but also tasted absolutely delicious. We have a few clients in the DC area and I definitely will think of you guys first! OMG, the cake was amazing. Thank you so much. It turned out even better than I imagined and tasted amazing. You did awesome. Everyone kept asking who made it. The cake was absolutely beautiful. All she could say was "wow!" Thank you so much. The cupcake cakes were absolutely great!! Everyone was very impressed and many had their pictures taken next to the cakes. Not only did the cakes look great, but every one of them was eaten!! What a great combination -- LOOKS GREAT, TASTES GREAT!! I wish you left more biz cards and brochures -- many asked who the baker was. Thank you for a great addition to our annual dinner gathering. I am thankful that I came across your site. Please allow me to tell you that the cake was a hit. It was absolutely easy to order. You are absolutely pleasant and easy to work with. I thank you for your exemplary professionalism. It was a pleasure working with you. 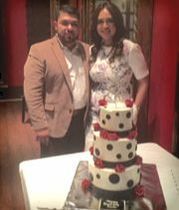 You made our ceremony so memorable with that beautiful tasty cake. Thanks again! I wanted to thank you for the awesome cake you designed and made for Janan's shower. Everyone wanted to know who made that beautiful cake and the exquisitely crafted and decorated cookies. None of the women seemed worried about gaining weight because they devoured the cake AND the cookies. Again, thanks for everything. First off, I have to say THANK YOU for the amazing service you gave me. Your personality is cheerful and very easy to talk to, whether we spoke in person or by email. Secondly, the cake was HIT! It looked great. Everyone just thought it was the cutest! And most importantly, it was delicious! The cake was super moist and tasty. The frosting was light and not too sweet. Just the perfect cake! Anyways, I had to send you this email of appreciation and thanks. It was a great day and your cake just made it so much better! And just as an FYI, we will be ordering from you again! Thanks so much for the exceptional job well done on our Lunar New Year cake! The sheet cake was not only a crowd-pleaser, but practical for serving our large crowd, and most importantly absolutely delicious. Once again, thank you! But to be honest, I'm not surprised based on your previous work. I wanted to say a big THANK YOU for the cake! It turned out amazing and I was so happy you were able to deliver it despite the snow (I hope it wasn't too terrible of a day for deliveries). Brian and everyone at the party was absolutely obsessed with it and couldn't believe how moist it was, delicious! I just wanted to say that I loved the Rainbow Cake that you made for Lincoln. Looked great with his outfit. I could not have asked for anything more perfect. He didn't want to smash it like he was supposed to so we had plenty of cake leftover. Plus it tasted amazing. Thank you again. I will definitely keep you in mind when others ask, and for our future needs. I just wanted to let you know that I thought the cake was everything I had hoped for and more! It was the centerpiece of the "gender reveal" baby shower and it came out exactly like I wanted! I will definitely use you again! I wanted to make sure you knew that the cake was a big hit! Both flavors were delicious and moist! Many asked who made the cake and I let them know. Also the Amtrak blue was a big hit. My fingers were blue after cutting the cake for everyone! The cake was a big contribution to our event and contributed significantly! I just wanted to extend my gratitude for the GORGEOUS cake that you prepared. It was absolutely everything, and more, of what I envisioned. My sister-in-law was beyond words (no shortage of tears) and the family could not believe it was an actual cake :) . Phenomenal job and tasted great! Thank you again Chris for making that a memorable and perfect day. I appreciate you so much! I hope you add that picture to your site because it was truly a work of art! Wishes for continued success and prosperity!